-Book 5 nights in the off-season after Labor Day and get two nights for free! Tired of looking through tons of listings? Do you need a specific type of home or dates? We are a local family owned company, Exclusive Properties, located right here on Isle of Palms. We specialize in beautiful, luxury or budget friendly vacation rentals and can help you find the perfect home. We are familiar and live in the area and will make the process as easy as possible. Just email us and one of our friendly vacation specialists will get back to you right away. 'Palm Manor' is a beautifully decorated, 4,500 square foot beach home featuring eight bedrooms and eight and a half baths, ideal for family reunions and large groups. Guests will appreciate the additional outdoor space with the outdoor decks and a private pool. Palm Manor also features a private elevator, Brazilian cherry hardwood floors, gourmet kitchen, private pool and close proximity to the beach as well as the restaurants and shops on Front Beach. Our homes come with a check out clean and linens for each bedroom. If you would rather bring your own, we can take off a linen fee of $350. You will also have the chance to purchase additional bath towels and purchase beach towels. The kitchens are equipped with all of your cooking essentials. You just need to bring the food. We can also arrange to have the kitchen stocked with food before you arrive. Just ask us for details after you book. We require the first half of your rental amount at the time of booking. The remainder of your rental amount will be due 45 days prior to your arrival. If you book within 45 days of your intended arrival, full payment is due at booking. We offer travel insurance to all of our guests through Red Sky. Red Sky specializes in the Isle of Palms area and covers you in the occurrence of a mandatory evacuation, medical emergencies, loss of a family member, loss of job, etc. The cost is 7% of your rental cost plus tax. Please email for exact cost. We recommend getting travel insurance through us. Each reservation is charged a $1,000 refundable security deposit. The security deposit will be run in the week leading up to your arrival, and will be fully refunded within 30 days of your departure after we have inspected the home for damages. Sometimes this is done and returned quicker than 30days. This security deposit is not included in your quoted rate on VRBO/Homeaway. Exclusive Properties' vacation rentals are designed for the traveler accustomed to luxury. 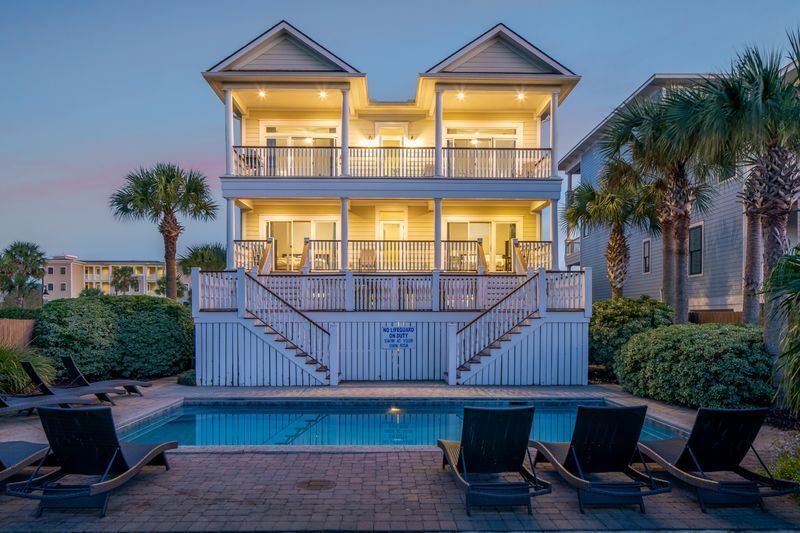 Our vacation rentals on Isle of Palms and throughout Charleston feature such amenities as infinity edge pools, roof top hot tubs, pristine oceanfront views from decks and piazzas, spacious gourmet kitchens and backyard putting greens. Call today to speak to one of our experienced beach vacation planners! Our friendly staff will make sure you are matched with the perfect beach vacation house that is best suited for your family, taste and budget. Each of our vacation planners has extensive knowledge of Charleston, SC and specifically the Isle of Palms area as well as personal knowledge of all the beach vacation rentals that we offer. We all live in the beach area and can direct you to the local favorites as well as the must see attractions throughout the beautiful lowcountry. toilet, shower, jetted tub, Located on first living floor. toilet, shower, Located on first living floor. Private Pool with wrought-iron furniture, Jacuzzi Tub in one master suite, Wireless High-speed Internet, Huge 52' Flat-screen TV, Gourmet Stainless-Steel Kitchen, Heating, Ceiling Fans, Cable TV, 2 Dishwashers, Stand-alone Freezer, Stand-alone Ice Maker, Ceramic-top Stove, Double Oven, Toasters, Coffee Makers, Iron, Ironing Board, Patio, Balcony, Deck, Brazillian Cherry Hardwood Floors, Granite Countertops throughout, High-end furniture and extremely comfortable mattresses, elevator. Open kitchen and expansive living areas are located up top for the best views of the ocean! Great house for entertaining. Excellent, beautiful home with plenty of room for our family! Beautiful home with all of the amenities! Excellent location! I cannot say enough great things about Exclusive Properties and this amazing property. The house was in pristine condition upon arrival, and our group couldn’t stop talking about how beautiful it was! The location of the property was perfect. Great proximity to beach access and all that Isle of Palms has to offer. The staff at Exlusive Properties were so helpful from the moment I booked the property until departure! I will be visiting again, and highly recommend booking with Exclusive Properties. Fabulous Beach House with a great Ocean View! Perfect location just a few steps away from the beach access, restaurants, and shops! All bedrooms are spacious, plenty of space inside and out for large groups including children. The private backyard in ground pool and porches are relaxing especially the rocking chairs with views of the sunrise and the Ocean. Multiple refrigerators and the built in under cabinet ice maker was a life saver! This house will exceed your expectations!!!!!! Palm Manor was perfect for a long weekend in South Carolina. The house was massive and immaculate and a perfect location for fun and relaxation. We will definitely be back in the near future! Gorgeous, roomy, comfortable and a great place! We had a wonderful stay. There was plenty of room, all the amenities you could wish for, comfortable beds and living room furniture, a wonderfully well-supplied kitchen, plus a terrific location and a nice view of the ocean. I highly recommend this house! This is a perfect choice for a family (or multi-family) vacation! The house has everything we needed for a week of fun at the beach and by the pool. The proximity to the beach and local restaurants could not be better. We could access everything we wanted or feel completed secluded in the back yard by the pool if we wanted to. Our daughter had a wonderful time and we had a carefree week! Highly recommend this property!